All lumber is graded FAS or better and chosen for outstanding quality, color & grain. Made with precision craftsmanship, each casket must pass a 10-point quality control inspection to guarantee your satisfaction. 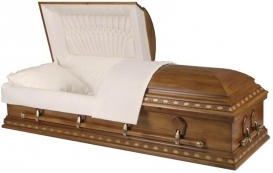 Fits comfortably in standard size burial vaults.